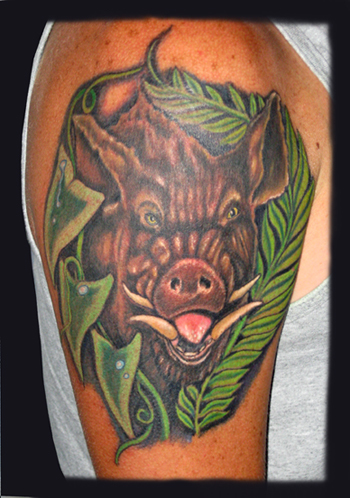 If a young man wears a wild boar tattoo, he is probably wearing it as a symbol of his courage. As such it can be traced back to the Borneo ritual of a young boy’s first successful hunt in which he manages to kill a wild boar, to mark his rite of passage from boyhood to manhood. In many parts of the world, hunting wild boar was a popular sport. Boars are uncastrated male pigs with razor-sharp tusks known for their ferocity and courage – they will fight to the death to defend their territory if cornered and so made redoubtable opponents for hunters. Because of its great strength and speed, it was chosen by King Richard III as his heraldic symbol. Wild boars and pigs have been the subject of myths and legends throughout history. Capturing the Erymanthian boar – a ferocious giant of a creature – was the fourth labour of Heracles (or Hercules). The fearless goddess Artemis (or the Roman huntress, Diana) sent her raging boars to ravage farmers’ fields when a country offended her in some way. According to another myth, Artemis sent a wild boar to kill Adonis when he insulted her pride by boasting he was the better hunter. The wild boar therefore symbolised her propensity for seeking violent revenge. In Chinese and Norse mythology, they were symbols of fertility and virility. In Persia they signified that the wearer of the symbol was a skilled warrior. In some cultures boars have religious significance. In Hindu mythology, for example the third avatar of Vishnu was a boar which symbolised resurrection. And of course, one cannot forget the importance of wild boars to the ever-hungry Obelix, friend and companion to Asterix in the popular, long-running, French comic book series. Obelix could eat several roasted boar at one sitting! In the Chinese zodiac there is no difference between the pig and the boar and those born in its year of reign are noted for their chivalry and gallantry. Like the creature in the wild, once they have made up their minds, they will not back away from something. They are fiercely loyal and, whilst they don’t make friends easily, those they do make, they keep for life. They are studious, well-informed and kind. Although they can be quick-tempered, they generally dislike arguments and prefer a peaceful life. They are also very tenacious and dislike giving up, believing that there is a solution for everything. 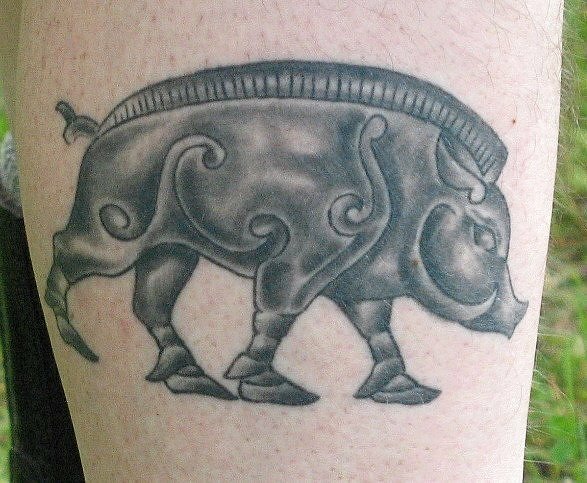 Because pigs are merely domesticated versions of their wild ancestors, the wild boar tattoo can symbolise a certain duality of nature, both wild and tame at the same time. If you have chosen this powerful heraldic beast for your design you will no doubt have your own reasons and beliefs about certain aspects of your personality or character. You may want it to reflect that you are strong and brave – a true warrior, or to signify territorial aspects. Perhaps it reflects some great achievement in your life or that you were born in the year of the pig. 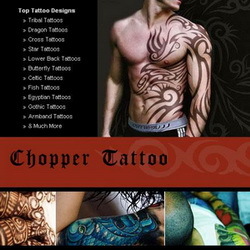 Whatever your reasons your wild boar tattoo will certainly be a conversation piece and something you can wear with pride.